Tibesigwa, Byela. 2018. 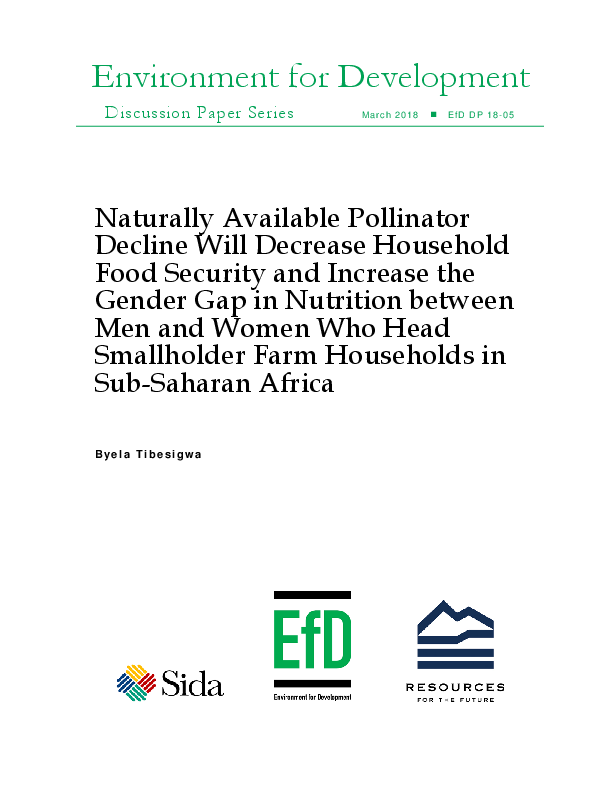 “Naturally Available Pollinator Decline Will Decrease Household Food Security and Increase the Gender Gap in Nutrition between Men and Women Who Head Smallholder Farm Households in Sub-Saharan Africa.” EfD Discussion Paper Series 18-05. This multi-country analysis studies the food security implications of natural pollinator populations in sub-Saharan Africa, where smallholder farmers rely on wild pollinators in the absence of commercial pollination services. The study specifies daily intake of energy, macro-nutrients, minerals and vitamins per household member, and identify differences in pollinator dependence in male- and female-headed households. Four key observations emerge. First, smallholder farm households produce a menu of food crops. Second, the average household kilo-quantity harvest consists of 57% pollinator-dependent, 34% pollinator-independent, and 9% with unknown pollinator responsiveness. The kilo-quantity from pollinator-dependent crops is higher in female- headed farm households, while the kilo-quantity from pollinator-independent crops is higher in male-headed households. Third, considering only the share of crops retained for household consumption, the contribution of pollinator-dependent crops to daily nutrition is greater in female-headed households. Fourth, the gaps in consumption between male- and female-headed households are much higher for pollinator-independent crops (18% to 68%) than pollinator-dependent crops (-6% to -33%). This suggests that any decline in pollinators is likely to enhance the existing consumption advantage in male-headed households, leaving female-headed households even more food insecure. Therefore, policy discussions around conserving pollinator habitats should be tailored to issues of gender, crop menu, and nutrients. The results are also relevant to ecosystem services policy and suggest that gender perspectives need to be considered, as the benefits of naturally available pollination services to vary by gender. Although this requires further exploration, it does suggest that ecosystem services accounting should re-think the homogeneity of the welfare benefits approach.